A friend/fellow cyclist read the above-linked story, and sent Rep. Orcutt a letter in response. Credit where credit is due, he wrote back, further elaborating and expanding upon his perspective on things transportation-wise in our fair state. Read on below, and draw your own conclusions. 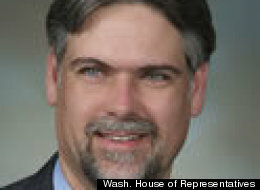 Please remember, though: this guy is on the House Transportation Committee. Really. Thank you for contacting me regarding the transportation tax proposal recently unveiled by the Chair of the House Transportation Committee. I have serious concerns about that proposal, including the amount of money that will be charged to motorists for alternative modes of transportation. I have had concerns about local options, however, I am willing to look at allowing high congestion, high project cost areas the opportunity for local options. But, local options for transit should come from general taxes rather than putting the burden of paying for transit on those who do not use it – those who drive automobiles. It would have to be something other than a motor vehicle excise tax (MVET) or registration fee on automobiles in order to garner my support. I do hope that money will be prioritized to help seniors, disabled and low income citizens rather than for commuters who are saving large amounts on fuel, parking and maintenance by taking transit rather than driving their own cars. Certainly, with those savings, many of them could afford to pay a higher bus fare. Currently, the proposal would provide $120 million for transit over a 12 year period. A total which I think is too high from a STATE funding package. And, it likely is coming from fees on automobiles (additional weight fees of $10-30/year), a source which concerns me, so I cannot support a package that would spend 3.5 times that amount. I do support funding safe streets to assure that there are safe routes to school for our school students, and supported amendments in the operating budget to do so. But, I am concerned about using the $100 million ($8 million/year) in the proposal for ALL bicycle or pedestrian proposals – especially not when paid for by motorists – so cannot support funding at $20 million each year for ALL bike/pedestrian programs. If there is need for more for the Safe Streets program, I may be able to support additional appropriations for Safe Streets as funds may be available. I do think, however, we do need to get a better idea on how much need there really is for “Safe Routes to School”. Stormwater runoff is a concern but is addressed on all new projects – and when a project is a widening or improvement, the current stormwater standards are applied to all portions of the project, not just the expanded portions. It is already included. The area where we need to focus more money is on fish passage barrier removal – something we must do in response to a court case the state lost. This will result in costs of $155,000,000 in additional costs each year. It is my hope that instead of driving up the cost of projects even more, or creating new standalone projects, that we can use currently required mitigation money for removing these barriers. We do need to address our aging infrastructure, but also need to address the cost of our transportation projects. We received testimony in the House Transportation Committee that our projects can cost 1.5-2.5 times as much as similar projects in similar areas of other states. We truly need to get our costs in line with other states so we can get more of these projects done – and fixing the worst first is always the best approach. I think we need to be certain when we approve a project that we have good information and a good plan in place BEFORE we start the proposal. The number of change orders at the beginning of the Alaskan Way Viaduct project and the project manager’s attempt to justify those is of great concern to me. It is my hope that projects like this will not lead to delays or elimination of other critical projects because we did not do our due diligence on certain projects. I agree that we need to prioritize money on fixing current highway infrastructure – but along with fixing our infrastructure, we need to fix the cost drivers on all of our projects. Without doing so, we will never be able to fund all of the demands for tax dollars to build and maintain the infrastructure the citizens are demanding. I feel that we need to make our current tax dollars go further before we go further into taxpayers’ pockets. I hope this clearly states my position on the requests you have made. Firstly, thank you for correcting your recent offensive and ridiculous statement regarding the CO2 emissions of bicyclists. It is a pity you felt justified in making it in the first place. As a bicycle commuter, I am well aware that drivers of personal automobiles despise me, often to the point of wishing my life to end. While I know that I am accomplishing a healthier and happier commute for myself while reducing motor vehicle congestion for said drivers, there is still an unconscionable backlash against me and my peers. Statements such as yours highlight this hatred and the willingness of elected officials to pander to it, rather than protecting all citizens. Secondly, I ask you to move forward with Washington transportation issues based on facts, not politics. The Washington House Transportation Committee have a monumental task to control traffic congestion, control regional air quality, and provide safe infrastructure for both drivers and vulnerable road users, all on a limited budget. I know you are now aware that a sales tax on higher-cost bicycles will collect no more than $200,000 per year, while decreasing revenues for bicycle shops (local small businesses), by encouraging cyclists to spend less money on bicycles or to purchase higher-cost bicycles out of state. Clearly, a penalty on small business owners that does not produce substantial revenue is a bad idea. It is also clear that this provision is more of a political gesture in support of those who resent cyclists for “not paying their fair share” for the roads. You yourself made this point, saying that, while cycling, cyclists are not paying gas tax. Surely, as a member of the House Transportation Committee, you are also aware that car tabs and gas taxes cover less than half of Washington’s transportation costs. Cyclists not only contribute to car tabs and gas taxes, we pay the property taxes and sales taxes that fund the majority of Washington’s transportation spending. We not only pay our “fair share”, we actively work to REDUCE transportation costs by reducing congestion, emissions, and road wear. You are likely also aware that a sizable portion of Washington’s transportation spending is for highways not even used by cyclists, meaning we actually contribute well more than our “fair share”. Small investments in bicycle infrastructure, tax BENEFITS for cyclists, and any programs or spending that encourage more people to commute by bicycle instead of personal automobile, all serve to reduce the state’s transportation costs, reduce traffic congestion, improve regional air quality, and improve road safety for all users. Any transportation package that omits bicycle infrastructure or penalizes cyclists is reckless and not based in fact. Please uphold your duty to ALL citizens of Washington state. ~ by crosssports on April 25, 2013.